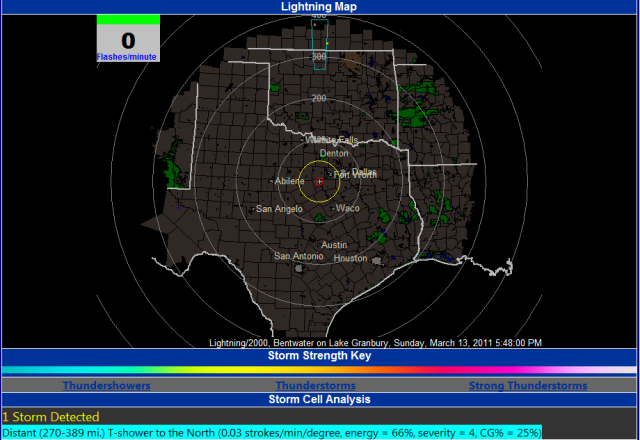 The data presented in the Lightning Map, Detector Summary and Storm Cell Analysis is color keyed to indicate the relative strength of the storms. This color scale is shown in the Storm Strength Key below the Lightning Map with the associated storm classes below ranging from thundershowers to strong thunderstorms. On the map, storms are represented by a box indicating the relative distance of the strokes associated with the storm. The border color of the box of the fill color of the box represent the intensity of the storm. If the box is a solid color, that indicates a high content of positive cloud to ground strokes which generally indicates that the storm is or has the potential to become severe. Below is an example of some strong and severe thunderstorms, two of which have a high content of positive cloud to ground strokes. When a storm is represented by a circular or oval shape, the indication is of more tightly grouped strokes and that lightning is extremely likely in the immediate area. Below is an example of such a storm depiction. In addition, if there are storms within the yellow range ring (30 miles of Bentwater), the border of the map will be yellow ("yellow alert"). 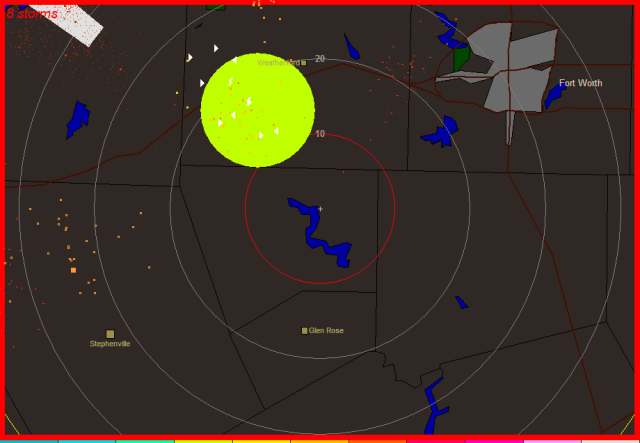 If there are storms within the red range ring (10 miles of Bentwater), the border of the map will be red ("red alert"). The Storm Cell Analysis will show information for each of the storm boxes presented on the Lightning Map. There may be storms indicated in the Storm Cell Analysis that do not have a corresponding box on the Lightning Map if the storms are distant enough to be beyond the limits of the map. The Analysis contains some specific information regarding the relative strength of the strokes in the storm. REMEMBER! 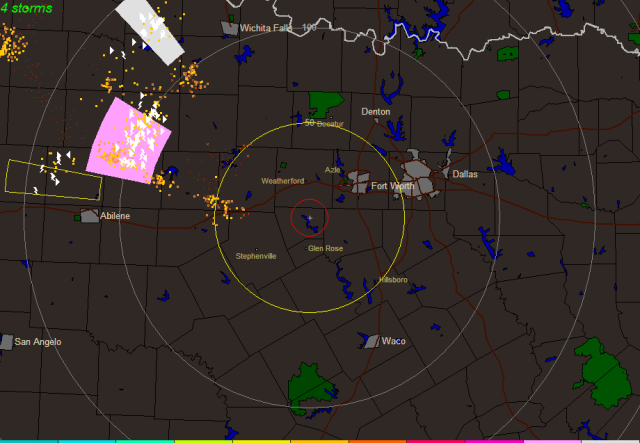 Do not make safety decisions based solely on the information shown on the Lightning Detection page. These images and analysis are for informational purposes only. Seek further information from the National Weather Service and/or radio and television before you expose yourself to potential thunderstorm activity!